During drilling or cementing operations, drilling fluid or cement slurries may be lost into the permeable or cavernous formations. This is called lost circulation. Treatment of lost circulation has become an important aspect of a successfully constructing a well. Pumping in lost circulation treatment material (LCM) while controlling bottom hole pressure and temperature requires a complete understanding of the hydraulic and thermal conditions in the wellbore. Pegasus Vertex, Inc. developed LCPRO to assist in the design of drilling, cementing, or well treatment operations where lost circulation is present. The simulator models the fluid displacement process with a planned pumping schedule, different loss conditions, and any annular filling operations. 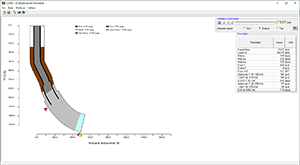 Specifically, LCPRO calculates the dynamic pump pressure, ECD and wellbore temperature for multi –fluid displacement. It can also predict the degree of loss of circulation, based on wellbore/formation pressure differential. The impact of the loss of circulation on temperature profile is modeled for users to select loss of circulation material (LCM) and to provide operation guideline to stop loss of circulation.